From Ben Hogan Golf: "The Ben Hogan Apex Edge is the first two-piece forged iron with a forged Carbon Steel frame and forged face. This breakthrough technology, coupled with many other unique game-improvement design features, make the Apex Edge extremely easy to play. 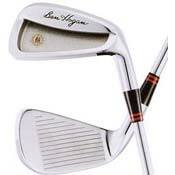 Now passionate golfers of all ability levels can experience the feel only Ben Hogan forged irons can provide." Forged feel, probably the most beautiful irons ever made, love everything about them except that they're not made anymore.. I selected these clubs in a custom fitting session, overwhelmingly preferring them to the Ping, Callaway and Taylor Made competitors in the "forgiving club" category that I was also testing. At my instructor's urging I had them made with an extra 1" in length and bent 2 degrees closed, and got the whole set 2-E, with Apex blade gap, sand and lob wedges too. I have never regretted this decision! Have played them for over 10 years and they still make me smile every time I hit! Fabulous club with amazing feel. Combined with a low compression ball, swinging is smooth as silk. Look out Freddie! I just bought a set of the Adams A12 OS to replace my Apex Edge irons. What a mistake. Today I put my Hogan's back in the bag. I have the complete set(3-9, E, Sand wedge, and lob wedge) I won at a casino in 2002. I will never sell these clubs. I fit my own clubs. Length = I add 3" to standard. Lie angle = I bend them 2-3 degrees flat. The HOGAN APEX EDGE is a great club for bending. They are softer steel and don't break like the many stainless ones I have tried and broke while bending. I am not real convinced if forged feedback claims are really all that much of a benefit to the average golfer. But then the 2 ounces of lead that I add may deaden any feedback. But forged steel sure is a dream when it comes to bending lofts and lies. Always like the looks and quality of Ben Hogan clubs. Was looking for a new set of irons but didn't want to spend a fortune for a pro quality set of irons. Found these online for $375 in like new condition. Was a little worried that a forged club would not be suited to my game but found these forged cavity back irons to be very forgiving while providing great feel. These irons look great and perform with the best. I would highly recommend these to anyone except maybe very high handicap players. An excellent club that you can find at very reasonable prices! Have been playing since 2003. I do not have consistent swing. A friend who just picks up the game have been hitting consistently (and a Class A player within a year) owns it. Have tried hitting his club in the range and found it made the ball fly any type of hit I make. And I fell in love with the club right away. When he sold his pick-up truck to me, I negotiated that the club goes with it. He agreed and I got the club for free. Because the club being heavy for me, I gave it to my son as his set. I am using a Callaway X-20 graphite but have inconsistently hit the target with 20-30yds target deflection. Remembering the shot and confidence I have with the Ben Hogan Apex Edge irons, I gave it a try. I played with the previous owner of the club and he could not believe my iron play which I could not believe too. I broke 90s playing with him. And when I played with another Class-A Korean friend for the second day, he cannot believe the 2nd shots I am making, and all happiness in my face. Though this club is heavy in weight for me, it gave me a lot of confidence. I really enjoyed playing golf and found new love in the game, saving some strokes, surprising golfmates and will continue to surprise them playing with Ben Hogan Apex Edge irons. A friend of mind use Ben Hogan some years back. I alway like the look of the clubs, but didn't think I could hit because they so blade like and costly at this time. This year I saw a set at the local golf store at a very good price. I bought my set on line. My first round with these club was bad. I continue, each round got better. I how in love with these clubs, the feel, the response, feedback and looks. I play shooting in the 80's now with little effort. Great set of irons. I have never been able to hit the 3 iron the way I can with these irons. I purchased this set of irons six months ago and I have been having a blast ever since. I finally broke into the 70's last week. I also love the polished look of these clubs in my bag. OK I thought I was nuts getting these clubs all my friends said too hard to hit etc. Bought them new rockbottom around 200.00. Well I have to admit at first they were alittle challenging. But with alittle practice you can hit these clubs very well. They are made by Callaway and I am happy with the quality compared to my Adams clubs. They easily give me feedback. Performance? couldn't be happier. Lets just say when I am 200 yards from the green I can and do use my 3 Iron with confidence and I am leaving my 5 wood in the bag more and more. WOW that never happened before! I love these clubs and I love the chrome (alot easier to clean than brushed cast metal) and the style is timeless. Too bad Callaway decided not to make them anymore I hope they change their minds. I recommend these clubs, everyone should try these clubs. I will ALWAYS compare all other future irons I try with these clubs. They truly have helped my iron play and the give me boat loads of confidence. I like them so much that I am looking for a second set.